Worldwide. Usually in soil. Some are herbivorous, others predaceous, actively hunting small arthropods. 7-9 Families (5 in North America), 800 Species (70 in North America). The fossil record of diplurans is sparse; there is an apparent Dipluran from the Carboniferous. Derivation of name: diploos - double, oura - tail, referring to the two prominent cerci. Bareth, C. and B. Condé. 1958. Campodéidés endogés de l'ouest des États-Unis (Washington, Oregon, Californie, Arizona). Bull. Soc. Linn. Lyon 27:226-248,265-276,297-304. Chandler, L. 1956. The orders Protura and Diplura in Indiana. Proc. Indiana Acad. Sci. 66:112-114. Condé, B. 1949. Campodéidés cavernicoles de la région Appalaches. Notes Biospeol. 4:125-137. Condé, B. 1956. Matériaux pour une monographie des Diploures Campodéidés. Mem. Mus. Natl. Hist. Nat. (Paris) Ser. A Zool. 12(1955):1-202. Condé, B. 1973. Campodéidés endogés de l'Est des États-Unis. Bull. Soc. Linn. Lyon 42(special):17-29. Condé, B. and P. Geeraert. 1962. Campodéidés endogés du centre des États-Unis. Arch. Zool. Exp. Gen. 101:73—160. Condé, B. and J. Pagés. 1991. Diplura. Pages 269-271 in Insects of Australia: A Textbook for Students and Research Workers. Volume I. Second Edition. I. D. Naumann, P. B. Carne, J. F. Lawrence, E. S. Nielsen, J. P. Spradberry, R. W. Taylor, M. J. Whitten and M. J. Littlejohn eds. Carlton, Victoria, Melbourne University Press. Condé, B. and J. Thomas. 1957. Contribution à la faune des Campodéidés de Californie (Insectes Diploures). Bull. Soc. Linn. Lyon 26:81—96,118—127,142-155. Ferguson, L. M. 1981. Cave Diplura of the United States, Proc. 8th Int. Cong. Speleol. (Bowling Green, KY).1:11-12. Ferguson, L. M. 1990. Insecta: Diplura. Pages 951-964 in Soil Biology Guide. D. Dindal, ed. John Wiley & Sons, New York. Gereben-Krenn, B.-A. and G. Pass. 1999. Circulatory organs of Diplura (Hexapoda): the basic design in Hexapoda. International Journal of Insect Morphology 17:60-68. González, R. H. 1964. Japygoidea de Sud America. 6. Revisión de la Familia Dinjapygidae (Womersley, 1939) (Insecta:Diplura). Acta Zool. Lilloana 20:113—128. Hilton, W. A. 1932. The Campodea of California. J. Entomol. Zool. (Claremont) 24:47-51. Hilton, W. A. 1936. Campodea from the United States. J. Entomol. Zool. (Claremont) 28:5-10. Ikeda, Y. and R. Machida. 1998. Embryogenesis of the dipluran Lepidocampa weberi Oudemans (Hexapoda, diplura, Campodeidae): External morphology. Journal of Morphology 237:101-115. Ikeda, Y. and R. Machida. 2001. Embryogenesis of the Dipluran Lepidocampa weberi Oudemans (Hexapoda : Diplura, Campodeidae): Formation of dorsal organ and related phenomena. Journal of Morphology 249:242-251. Koch, M. 1997. Monophyly and phylogenetic position of the Diplura (Hexapoda). Pedobiologia 41:9-12. Kosaroff, G. 1935. Beobachtungen über die Ernährung der Japygiden. Mitt. Naturwiss. Inst. Sofia 8:181-185. Lawrence, R. F. 1953. The Biology of the Cryptic Fauna of Forests. A. A. Balkema. Cape Town, South Africa. 408 pp. Luan, Y., R. Xie, and W. Yin. 2002. Preliminary study on phylogeny of Diplura. Zoological Research 23(2): 149-155. Marten, W. 1939. Zur Kenntnis von Campodea. Z. Morph. Oekol. Tiere 36:41-88. Paclt, J. 1957. Diplura. Genera Insectorum de P. Wytsman, fasc. 212E. 123 pp. Pagés, J. 1951. Contribution à la connaissance des diploures. Bull. Sci. Bourgogne 13, Suppl. 9. 97 pp., 12 plates. Pagés, J. 1959. Remarques sur la classification des diploures. Trav. Lab. Zool. Fac. Sci. Dijon 26. 25 pp. Pierce, W. D. 1951. Fossil arthropods from Onyx-Marble. Bulletin of the Southern California Academy of Sciences 50:34-49. Reddell, J. R. 1983. A checklist and bibliography of the Japygoidea (Insecta: Diplura) of North America, Central America, and the West Indies. Texas Mem. Mus., Pearce Sellards Ser. (37): 1-41. Silvestri, F. 1932. Campodeidae (Thysanura) de España. Parte primera. Eos 8:115-164. Silvestri, F. 1933. Quàrto contribúto alla conoscènza dei Campodeidae (Thysanura) del Nord Amèrica. Boll. Lab. Zool. Cen. Agrar. Portici 27:156—204. Silvestri, F. 1947. On some Japygidae in the Museum of Comparative Zoology (Dicellura). Psyche (Camb.) 54:209-229. Silvestri, F. 1948. Japyginae (Japygidae:lnsecta Diplura) della fauna Italiana finora note. Boll. Lab. Entomol. Agrar. Portici 8:236-296. Smith, L. E. 1960. 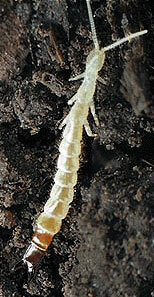 The family Projapygidae and Anajapygidae (Diplura) in North America. Ann. Entomol. Soc. Am. 53:575-583. Wilson, H. M. and D. M. Martill. 2001. A new japygid Dipluran from the Lower Cretaceous of Brazil. Paleontology 44:1025-1031. Wygodzinsky, P. 1941. Beiträge zur Kenntnis der Dipluren und Thysanuren der Schweiz. Denkschr. Schweiz. Naturforsch. Ges. 74(2):113-227. The Diplurans (Diplura) of South Africa. Compiled by Martin H. Villet, Rhodes University. Californica Academy of Sciences Diplura Type Collection. Page: Tree of Life Diplura. The TEXT of this page is licensed under the Creative Commons Attribution License - Version 3.0. Note that images and other media featured on this page are each governed by their own license, and they may or may not be available for reuse. Click on an image or a media link to access the media data window, which provides the relevant licensing information. For the general terms and conditions of ToL material reuse and redistribution, please see the Tree of Life Copyright Policies.